just as a mere happening. the path, making use of the tools and the method to reach that state. way, without the involvement of their parents. – With families, through monthly meetings. – With children, through Vasi Yoga classes. These classes should be considered as spaces where it is possible to evolve and share experiences with other people from the perspective of the Vasi Yoga rather than classes properly speaking. There are weekly spaces and also more intense spaces as for example the summer meetings. – With schools, as a way to make that both meditation and Vasi Yoga reach a more formal space such as educational centers, the purpose being to make schools become places for HAPPINESS. – Finally, our Ashram operates a school (a non-directive, free school) that besides instructing and helping children to get on well in this material world, is aimed at the awakening of the Bliss which the Siddhas talked about, meaning the liberation from the “ego”, i.e. the liberation from a structure of knowledge of a triangular character based on the distinction between the knower, the object known and the process of knowing. An open space for the practice of yoga. We offer a training program in Vasi Yoga, retreats and meditation courses for groups and families. 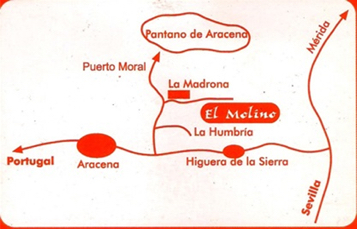 In the country state El Molino, you can find different types of accomodation. The ashram is located in Sierra de Aracena, a place charged with telluric energy. Take a look at our upcoming events.